This page of laminitis success stories is dedicated to all the equines who have survived laminitis or founder. It can be very scary when in the middle of a laminitic crisis and so the intent of this page is to offer comfort and reassurance to those in need. Scroll down past the form to see the stories. 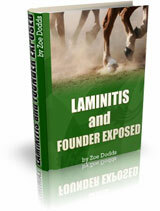 Do you have a horse or pony that survived a laminitis or founder attack? By sharing your story you could help give hope to others who are currently experiencing the devastating effects of laminitis. It's easy to do, just fill in the form below and your story will appear as a web page on this site to offer hope and inspiration to those in need. If you have more than one photo please attach each one to a new form. Click on the links below read about equines who have survived laminitis attacks. "I found "Laminitis and Founder Exposed" to be a comprehensive resource in treating this serious illness using complimentary therapies. The attention to detail and research makes this text a valued addition to any horse lover's library." Thomas Ebejer, Director of Queensland College of Oriental Medicine and Equine Studies, Australia.